The Kaweco Sketch Up Series offers a 5.6mm lead clutch mechanism encased in a solid brass shell with Black coating and chrome accents. Screw the back button off to reveal a nifty integrated sharpener. 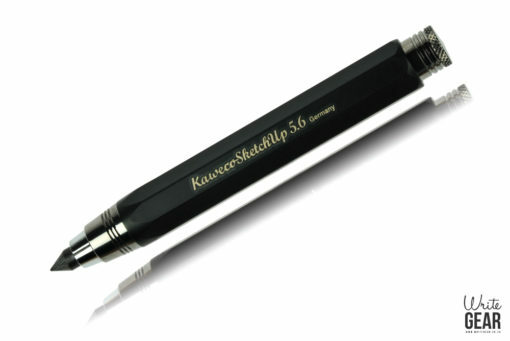 Sketch Up Clutch pencils as well as mechanical pencils have always rounded off the Kaweco range. Awesome little pencil. Has a nice chunky solid feel to it. Fits my hands perfectly but I have small hands. 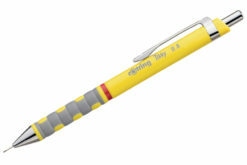 People with bigger hands might find this pencil too small. There’s no cap so there’s no way to post it to make it longer. The pencil is 101 mm in length without the lead exposed. 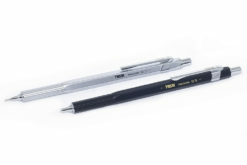 Heavier than most pencils but, unlike longer heavy pens/pencils where the weight forces the point upwards off the page, the length of this pencil shifts the weight downwards towards the point. A nice feature is the integrated sharpener. 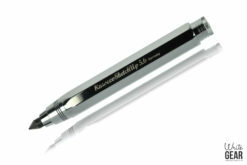 Unlike normal sharpeners where there is a sharp blade, this sharpener has 4 metal “blades” that taper to a point like a pyramid. The “blades” don’t look like they are sharpened like normal sharpeners but it looks like the edges of the metal “blades” are sharp the way an edge of a thick square piece of metal is sharp. I barely saw it in the picture but if you look closely you will see that not all the chrome parts are chrome. They are actually a gunmetal colour. Except for the part that grips the lead, that is chrome.